No DHCP: This wasn’t the router’s fault but, for a long time and for reasons beyond our control, we couldn’t enable DHCP in the router. Our network had been (poorly) setup so that broadcasts reached too far. 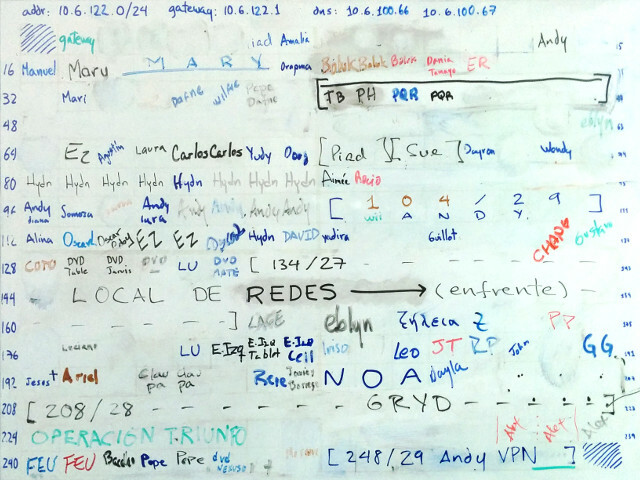 So if we enabled DHCP in our router, it would answer discovery requests from labs from across the building. This was fixed at some point, but our setup stuck longer. Hidden SSID: The router wasn’t sanctioned by the proper authorities, so we set it not to broadcast its SSID. This, along with having no DHCP, made it a hassle for new people to connect to the network, and some devices had trouble sometimes connecting or reconnecting to the network. Also, Windows machines showed there was some hidden network, and when there were more than one, guessing was required, which by Murphy’s Laws, never worked at the first attempt. MAC based access-control: At least the router supported making a white list of MAC addresses allowed to connect. That can be broken, but it was enough protection for our purposes. Just 20 MACs: Sadly, the list of MACs had just 20 entries. When we first set that up, a good 10 years ago, we had just a handful of wireless devices. By July last year, we were changing the list so frequently that if you didn’t stop by for two days you would certainly be dropped from it. The tool then interacted with our router’s web UI to put just the first 20 entries. With Vim’s modeline at the bottom, I guaranteed line numbers were displayed and comments were highlighted. It was simpler to edit this file and run our tool than struggling with the extremely limited web UI of the router. 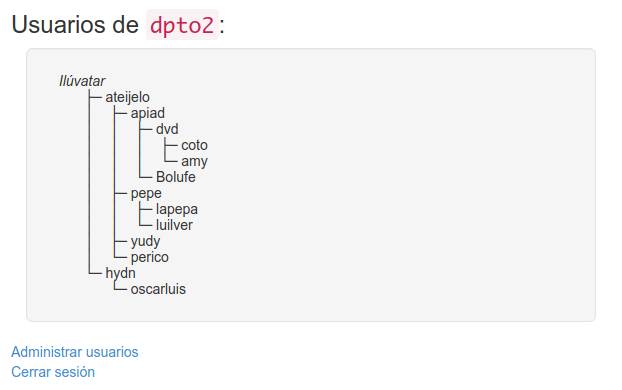 And it also let us keep a history of the changes in a git repo. This was a step forward, but still a hassle. When the crappy DLink router died, about a year ago, someone donated a Cisco router that wasn’t much better, but that happened to support Radius authentication. That meant we could move from MAC authentication to giving each person its own pair of username & password. So I set out to set it up and, in a few afternoons, I built a system & web interface to manage our WiFi and local network. Visible SSID: the politics around WiFi at the University had softened a lot in the last several years so we didn’t need to hide anymore and this was easier. No MAC access-control: I wanted a way to give access to the proper users that was more convenient and flexible than managing a list of MAC addresses. Guests: we needed a way of giving temporary access to our many guests without having some password spread all over the University. 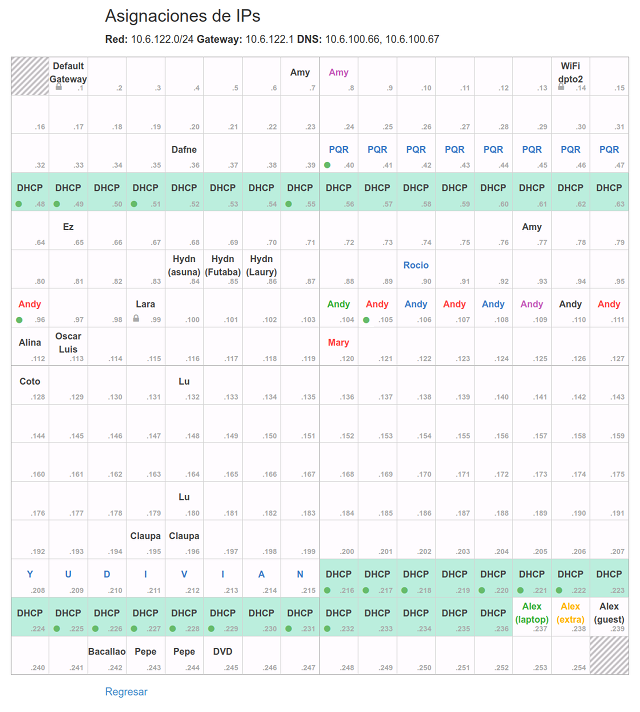 Web UI: to get rid of the whiteboard IPs table, I wanted to have an equivalent web interface. 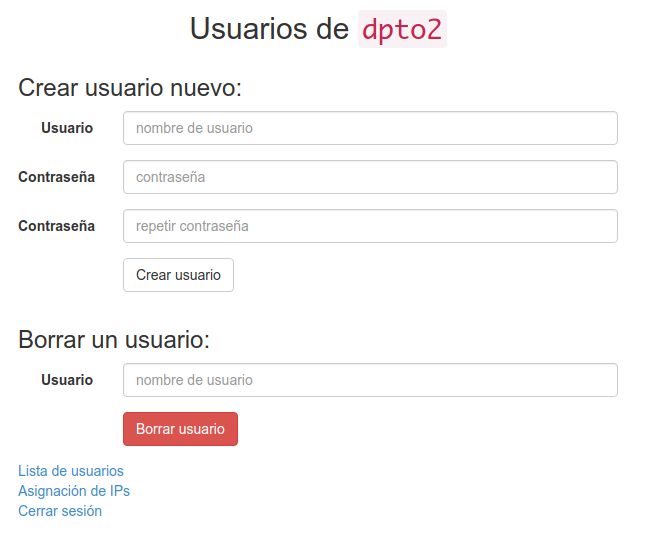 I also wanted a web way of managing the list of users. No superusers: managing the old list of MACs required admin access to the router. So only a couple of guys could do it. If they weren’t around people were stuck. I wanted every registered user to be able to manage the system. 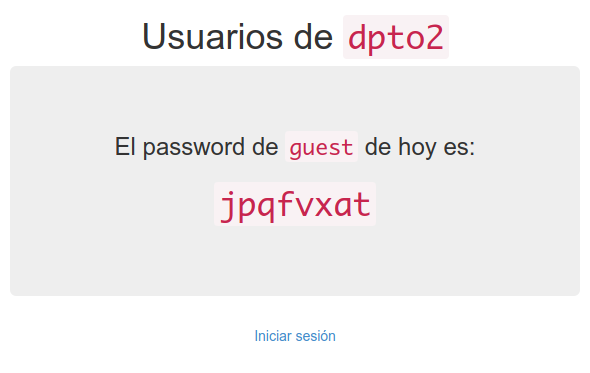 As the text shows, now there are users in the system, and a special guest user whose password is shown in the first page and is changed everyday to a random string. The string is all lowercase letters, so that users in mobile devices can enter it more easily; and we avoid symbols that can be confusing such as i, j and o. User authentication is managed by Freeradius, using a plain text file with NTLM passwords that we generate ourselves, since it’s just MD4 over UTF-16LE. This password scheme uses no salting, so if someone gets hold of the passwords file, they’ll have an easier time deciphering them. But the balance of simplicity and security is ok for the size of our system. To see that page, you must already have an IP in our network. That way, outside users can’t just visit the system and get the guest password. They must go to someone that’s already in and ask them. This isn’t bullet-proof, but, again, this is secure enough for our size. The first user, myself, was created by Ilúvatar (also myself). All other users must be created by some existing user. Except hydn, who didn’t know how the system worked and went on and read the source code to figure it out and created himself directly in the users database file. 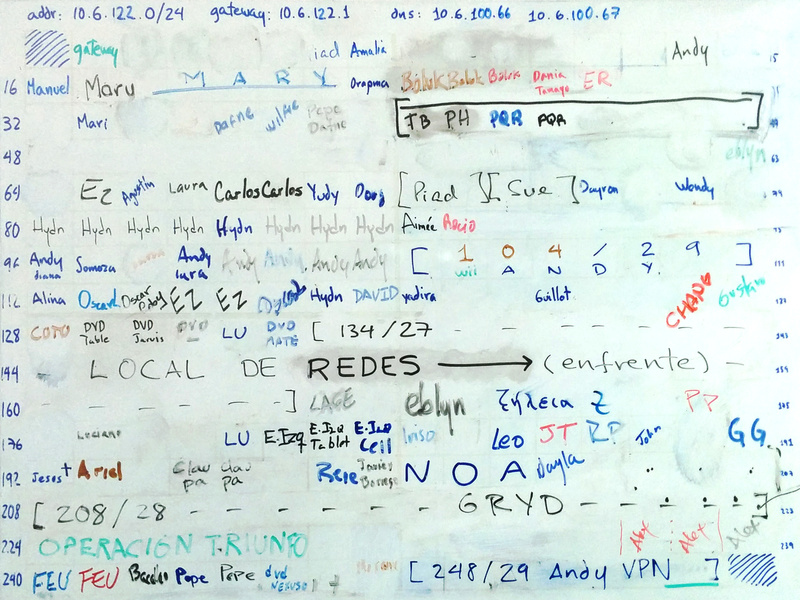 The in the images above marks the addresses that are currently leased via DHCP. Although in dnsmasq.conf all addresses are in the DHCP pool, the file above reserves them all for an unlikely MAC address: ff:ff:ff:ff:ff:fe. Only the addresses that are not listed in this file are really free to be assigned to DHCP requests. When a user of the system reserves one IP, a comment is added to the file before the corresponding line. The comment is a small JSON with the user settings. Address .104 above is reserved by Andy, is colored green, and it’s not part of the DHCP pool, since it has the unlikely MAC address associated. Address .105, as shown above, has a tag, the set:... part. That’s Dnsmasq’s way of sending special DHCP settings to specific clients. If the user chooses to have an alternative gateway, that tag is added and a line like the following is written in the dhcp-opts file. 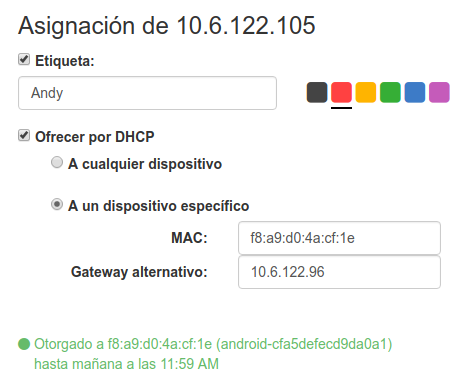 Now when that specific client connects it will receive a different router option via DHCP. The system is of course open source, and all the caveats apply: it comes with zero warranties, especially those of merchantability or fitness for any purpose. Check the code and grab your copy here.